Dr. Krista McKenzie earned her Doctor of Dental Surgery Degree from New York University College of Dentistry in 2009. During her studies at NYU she was selected to work in the prestigious Rosenthal Institute of Aesthetic Dentistry and also serve as an Assistant Clinical Teacher. Following graduation, she completed a General Practice Residency at Bronx Lebanon Hospital where she was awarded the Clinical Research Award for her presentation on the practice of modern and “green” environmentally friendly dentistry. 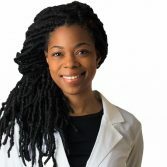 In keeping with her passion for cosmetic dentistry and smile rehabilitation, Dr. McKenzie is a participant in the Advanced Aesthetic program at NYU. Her expertise in cosmetic dentistry encompasses many procedures including veneers, Invisalign, direct bonding, and implant restorations all while focusing on optimizing dental health, patient comfort and satisfaction. Dr. McKenzie enjoys yearly outreach programs to treat underserved populations, and believes wholeheartedly in the ability of a healthy smile to positively impact lives.